Today was a work day. I worked on a novel for NanoWriMo called Wolf Girls. It’s a fun coming of age story about werewolves…and murder. It needs a subplot in the rewrite but so far so good on the main story line. Anyhow, I finished that story while doing nano and Book 2. Well today I wrote almost 600 words in that story. That’s right, even after 8.5 hrs of work, oversleeping and the completion of the first of three illustrations I’m working on: I had time to write. Also I opened a photobucket account. I am going to get into the Cracked.com Photoplasty contests. I want one of those under my belt and then I want to come up with a 5 Things Article… So step 1 complete. Today was a good day. Even got some compliments on my book The Angry Rabbit. Posted on December 7, 2013 by 1fuzzymonster. This entry was posted in Uncategorized and tagged angry rabbit, career, cracked, nano, nanowrimo, write, writers, writing. Bookmark the permalink. 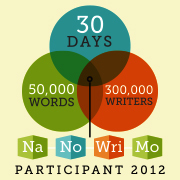 ← Day 2 Writing Career….